This article is about the national football team. For the national American football team, see Sweden women's national American football team. 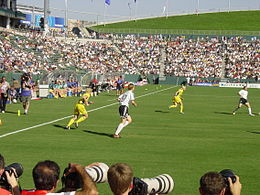 Sweden women's national football team (Swedish: Damlandslaget) won the European Competition for Women's Football in 1984, one World Cup-silver (2003), as well as three European Championship-silvers (1987, 1995, 2001). The team has participated in six Olympic Games, seven World Cups, as well as nine European Championships. Sweden won the bronze medal at the 2011 FIFA Women's World Cup. The 2003 World Cup-final was the second most watched event in Sweden that year. Lotta Schelin is the top goalscorer in the history of Sweden with 85 goals. Schelin surpassed Hanna Ljungberg's 72-goal record against Germany on 29 October 2014. The player with the most caps is Therese Sjögran, with 214. The team was coached by Thomas Dennerby from 2005 to 2012, and the current trainer is Pia Sundhage, who joined in September '12 after most recently winning the Olympic gold medal in London with the United States. Sundhage's contract goes into effect in December 2012. After winning the two qualifying matches against Denmark for the Beijing 2008 Olympics, the Swedish Olympic Committee approved of record increases in investments for the women's team. The new budget granted over a million SEK (about US$150,000) for the team and 150,000 SEK (about US$25,000) per player for developing physical fitness. The new grants are almost a 100% increase of the 2005 and 2006 season funds. The developments and conditions of the Sweden women's national football team can be seen in the Sveriges Television documentary television series The Other Sport from 2013. The following table shows Sweden's all-time international record, from 1973 to 2016. Note: The final game was called off due to heavy rain and adverse weather conditions, as a result, the Algarve Cup was awarded to both teams. The following players were selected for the friendly vs. England on 11 November 2018. Caps and goals as of 24 October 2018. The following players have been named to a squad in the last 12 months. *Active players in bold, statistics as of 24 October 2018. *Statistics as of 24 October 2018. ^ "Förlust i Örebro mot Tyskland". Swedish Football Association (in Swedish). 29 October 2014. Retrieved 29 October 2014. ^ Mats Bråstedt. "'SOK lovar damerna en storsatsning'". Expressen.se. Retrieved 26 October 2007. ^ Nordic Women's Championships 1974–1982 rsssf.com/ Retrieved 09–03–13. ^ Cyprus Tournament (Women) 1990–1993 rsssf.com. Retrieved 12–10–2013. ^ North America Cup 1987 rsssf.com. Retrieved 12–10–2013. ^ Australia Cup 1999–2004 rsssf.com. Retrieved 12–10–2013. ^ "Sveriges motståndare 1973–2016" (in Swedish). SvFF. ^ @Algarve_Cup (7 March 2018). "UPDATE: The match between the Netherlands and Sweden has been cancelled due to heavy rain. As a result, both teams will be awarded 1st place" (Tweet) – via Twitter. ^ "@svtsport". 24 October 2018. Wikimedia Commons has media related to Sweden women's national association football team. "När vi gräver guld i USA"
This page was last edited on 14 April 2019, at 08:15 (UTC).